Situated along the Gulf of Mexico, Alabama has 53 miles of coastline and about 1,670 square miles of offshore and inland waters. Major rivers include the Alabama River, Chattahoochee River, Tennessee River, and Tombigbee River. Major lakes include Guntersville Lake, Lewis Smith Lake, Martin Lake, West Point Lake, and Wilson Lake. A little over 3% of the state is covered by water. What is Alabama's maritime history? The state's offshore waters and river systems have served as important sources for food and transportation, especially during the heyday of the steamboat. Alabama's waters have seen their share of military action, too, including during the French and Indian War, the American Revolution, the War of 1812, and the Civil War. Archeological surveys of Alabama's waters are incomplete but, based on historical accounts, you can find shipwrecks from many different time periods in Alabama waters. During the Civil War, for example, the Union Navy blockaded ports along the Gulf of Mexico, which forced Confederate vessels to try and "run" the blockade. Both sides lost ships during this mid-19th century confrontation. Some wrecks from this period include the ironclads Huntsville and Tuscaloosa which rest in the Mobile River. The Tecumseh, the Union ironclad whose sinking prompted Admiral David G. Farragut's famous order "Damn the torpedoes, full speed ahead!," lies off Fort Morgan. Who takes care of Alabama's underwater archeological sites? The state owns all abandoned shipwrecks, remains of shipwrecks, all underwater archeological treasures, artifacts, treasure troves, and other cultural articles and materials regardless of association with any shipwreck on its submerged lands. Wrecks of Union and Confederate ships, like other military vessels, generally are not abandoned and not the property of the state. 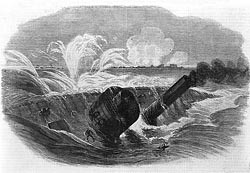 The U.S. Navy has jurisdiction over wrecks of Union vessels while the General Services Administration has jurisdiction over wrecks of Confederate vessels. The Alabama Historical Commission is the custodian of the state's underwater archeological resources, and the Alabama Department of Conservation and Natural Resources is the custodian of Alabama's underwater lands. These agencies work together to oversee the state's underwater archeological sites by composing management plans, classifying underwater historical sites, and maintaining repositories for recovered materials. What permits do I need to dive on or study shipwrecks? The state issues permits to persons who want to dive on or study Alabama's shipwrecks. Permit applications are made to the Alabama Historical Commission. The State of Alabama issues three different types of permits that are valid for a limited period of time. What laws concern underwater archeology in Alabama? The Alabama Underwater Cultural Resources Act is codified at Alabama Code �� 41-9-290, et seq. and related regulations can be found at Alabama Administrative Code Chapter 460-X-9-.01 to -9.03, and Chapter 460-X-12-.01. These laws and regulations declare the state's historical heritage to be among Alabama's most valued and important assets. The Alabama Historical Commission was created to foster the understanding and preservation of that heritage.